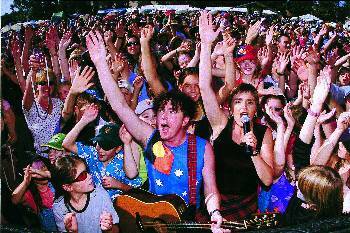 My very first live to air radio interview was with The BordererS — an Adelaide band based around Jim Paterson and his wife, Alex. The BordererS play a blend of music that’s hard to defind — actually, it’s easy to find (see link above), it’s a tad difficult to define, but once you’ve found it, you won’t want to de-find it. Aren’t typos fun? Where were we? If you put folk, Celtic, world and dance into a blender, it may come out sounding pretty much like this combo. Ever since that first inexpert interview, stabbing at buttons and sliding of faders, I’ve had the great pleasure to interview Jim and Alex several times, both in and out of the studio. This weekend they’re heading to Canberra to do two quite different gigs, and when I asked Jim how he’d be placed on Wednesday night for an interview, he said he’d be placed in a comfy chair in his lounge room in Adelaide. Which is where I caught up with him, telephonically. Bill Quinn: Jim, I’ve spoken to you many times before, but for others who are just catching up, tell us a bit about The BordererS. Jim Paterson: Well, I’m six foot five and look very similar to Brad Pitt. JP: Ehm, and my wife… she’s kind of like a midget. No, we’ve been going for nearly 19 years now, and I was just talking with someone today — Gabi, she’s our backing vocalist — and I said that after 19 years, we should be doing the reunion tour now, rather than still going! I’m Scottish and my wife [Alex] is Irish. And we play around the country and into Europe. And America next year; we’re going to go to America next September.